These Edge-Lit Restaurant Signs and Thousands of Other Displays are sold In this Online Catalog. This Company Currently Sells Over 4000 Different Products. Edge-Lit Restaurant Signs are Bought with Confidence from this Trusted Online Business. 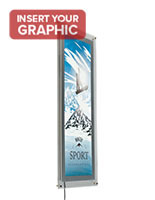 Posters are held in-between 2 clear acrylic panels with LED backlighting. 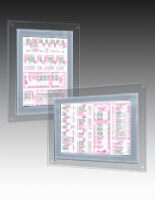 Duratrans prints are recommended for these edge-lit restaurant signs; however printer paper is acceptable. Included kit for hanging this piece in windows, sticking to glass with suction cups or screwing to walls with chrome standoffs. Silver border highlights graphics within the frame. These edge-lit restaurant signs, like plastic light boards, are able to hang within a window. This frame can adhere directly onto glass by using the supplied hardware. 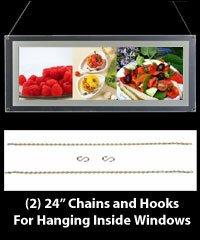 Customers can stick this product to windows by using the vinyl cups, or hang the unit with chains. Both kinds of hardware are provided, as well as a screws and standoffs surface attachment. The edge-lit restaurant signs that hang with chain can be positioned horizontally or vertically. 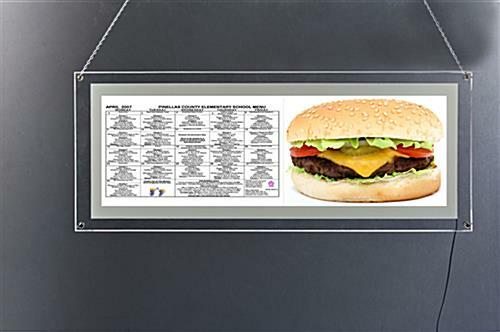 No matter what type of hardware is utilized for mounting this frame, these plastic light up menu holders let anyone exchange signage quite simply. Unfasten the (4) chrome standoffs and an advertisement inserts right into the frame. These edge-lit restaurant signs that are 1-1/8" thick have a slim profile, letting the unit fit where other illuminated box signage can't. 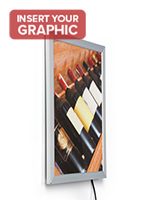 This characteristic also allows this lighted poster frame to not stick out far from a wall, and become obtrusive. The switch is located right on the electric cord, so switching the unit's power off and on is convenient. This huge edge-lit restaurant signs can showcase (2) 11" x 17" sheets. Printing a costly custom-made poster is unnecessary for this lighted plastic signage. 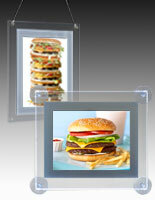 These light up picture holders, edge-lit restaurant signs can accommodate huge menus to display within windows. 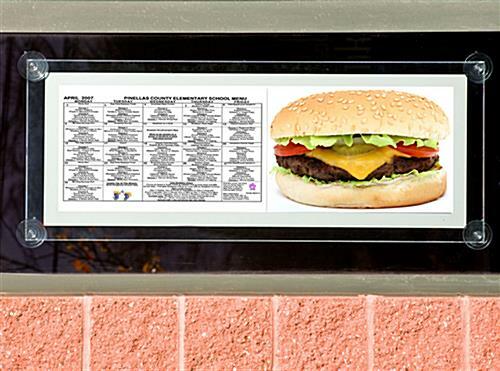 These edge-lit restaurant signs illuminate posters by utilizing light emitting diode technology technology. The unit saves on power because these lighted photo holders use less power than other illuminated signage using a conventional lightbulbs. This technology also stops the frame from getting too hot. These edge-lit restaurant signs that have an internal light up panel brilliantly illuminates any picture or poster users would like to display. Everyone will notice this signage holder when it is dark outdoors. 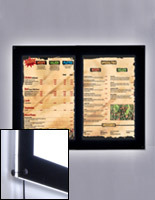 The acrylic edge-lit restaurant signs are very visible in dimly lighted rooms making these holders more easily seen than a regular photo frame. These edge-lit restaurant signs that are used for posters have a versatility that a wood signage or neon light boards just don't have. 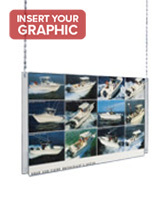 Other frames, sold by rivals, don't have as many hanging alternatives. 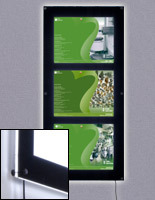 A pre-existing graphic can be shown in these picture holders, or users can have one custom made. These edge-lit restaurant signs are great for hanging ads inside a retail store or eatery. Please Note: Allow for 1/4" border around your 34"x11" photo. 39.3" x 53.8" x 1.1"